With burnout being one of the most common byproducts of our always-on society, it should not be taken so lightly. Burnout can have adverse effects on not only an individual’s mental wellness, but also a business’ profitability. 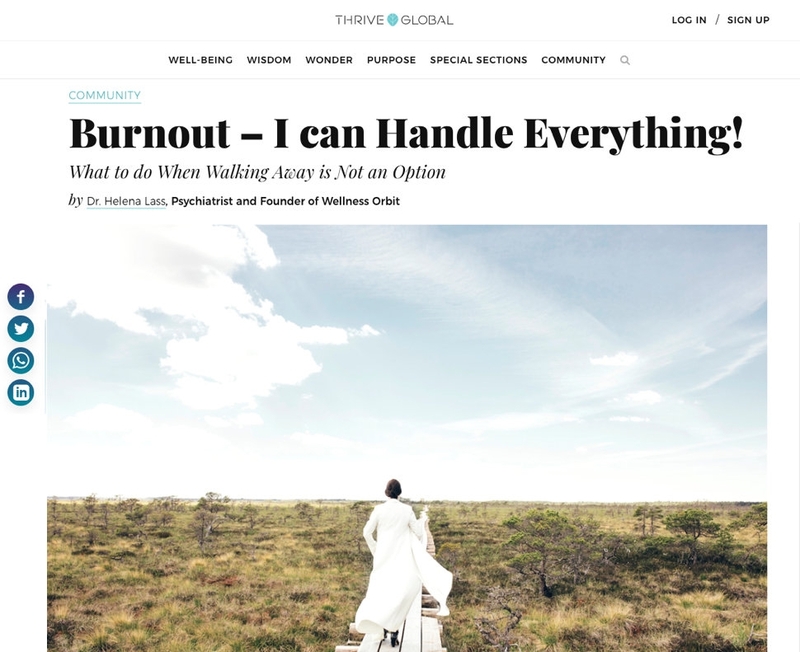 In her latest article, “Burnout – I Can Handle Anything!”, published on Arianna Huffington’s Thrive Global, Dr. Lass explores the topic of burnout. Dr. Lass looks into the differences between positive and negative stress, the early warning signs and five distinct phases of burnout and concludes with posing the question of how society as a whole should have a rethink towards the definition of success. 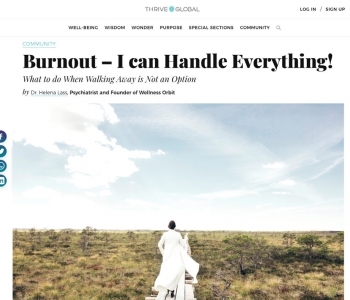 WHAT IS BURNOUT AND WHY AVOIDING IT IS KEY TO MENTAL WELLNESS? Have you ever heard someone say, “I’m exhausted”, or “I’m dead tired”? This is often how people unknowingly express the sensation of burnout. It’s widely known that burnout is closely linked with stress, but it is much more than just being tired and it is often the case that the seriousness of burnout is overlooked. What are the different kinds of stress (positive stress and negative stress) in relation to burnout? What are the early warning signs of burnout we need to spot? What are the five distinct phases of burnout? Is it time we revaluate what we deem success to mean in our modern world? Reading this proactive mental health focused article enables you to find out why is it time to revaluate our current life-style and work habits. Reading this story enables you to spot the warning signs of employee burnout more easily! Stress and burnout can both be easily prevented for you and your team. What is needed is a new and proactive approach in the form of Wellness Orbit’s mental wellness e-training ‘Performing Under Pressure’. One of our customers from Hurtigruten wrote this way about this mental wellness training: "Best training I have ever gotten. I am aware now about my thoughts and also about my stress level." Take me to e-training: "PERFORMING UNDER PRESSURE"